Bertrand Blanchard Acosta (January 1, 1895 - September 1, 1954) was an aviator who flew in the Spanish Civil War and was known as the Bad Boy of the Air. He was a heavy drinker, was divorced twice and received numerous fines and suspensions for flying stunts such as flying under bridges or flying too close to buildings. Acosta was born in San Diego, California to Miguel Acosta and Martha Blanche Reilly. His mother had a half-brother with the surname of Snook. He attended the Throop Polytechnic Institute in Pasadena, California from 1912 to 1914. He taught himself to fly in August of 1910 and built experimental airplanes up until 1912 when he began work for Glenn Curtiss as an apprentice on a hydroplane project. In 1915 he worked as a flying instructor. He went to Canada and worked as an instructor for the Royal Flying Corps and Royal Naval Air Service in Toronto. In 1917 he was appointed chief instructor, Aviation Section, U.S. Signal Corps at Hazelhurst Field, Long Island. Acosta was married in 1918 but he divorced his first wife in 1920. He set the airspeed record in 1921, then married Helen Belmont Pearsoll, on August 3, 1921. In 1925 he was a lieutenant in the U.S. Navy and was living at 1 Winslow Court in Naugatuck, Connecticut. He and Helen separated but they never divorced. In December of 1951 Acosta collapsed in a New York City bar and was hospitalized with tuberculosis. He died at the Jewish Consumptive's Relief Society sanitorium in Colorado in 1954. He was buried at Pierce Brothers Valhalla Memorial Park in North Hollywood, California. New York Times; New York City, New York; November 4, 1921; "Bert Acosta Wins Air Race Trophy; New York Aviator Defeats Five Contestants For The Pulitzer Silver Prize. H.E. Hartney Badly Hurt Parachute Jumper Drowned By Falling Into River After A 1,000 foot Leap At Omaha. Omaha, Nebraska, November 3, 1921. Bert Acosta of New York won the annual Pulitzer silver trophy race for heavier-than-air craft here today, defeating a field of five other contestants one of whom, H. E. Hartney of New York, was injured when his plane crashed near Loveland, Iowa." New York Times; New York City; New York; October 2, 1922; "Brings Plane To Earth Without Landing Gear. Bert Acosta Comes Down Safely at Selfridge Field. Astonishes the Onlookers. Mount Clemens, Michigan, October 1, 1922. Landing the Navy Bee Line racer, which he was testing preparatory to its entry in the airplane races at Selfridge Field, October12, 13 and 14, Bert Acosta brought the plane to Earth this afternoon without the use of its landing gear." New York Times; New York City, New York; October 7, 1923; "Aviator Sent to Jail; Judge Gives Bert Acosta Five Days for Driving Auto While Drunk." Time magazine; April 25, 1927; "Engineer Giuseppe M. Bellanca of the Columbia Aircraft Corp. had conditioned an elderly yellow-winged monoplane with one Wright motor, and scouted around for pilots. Lieut. Leigh Wade, round-the-world flyer, declined the invitation, saying Mr. Bellanca's plans were too stunt-like, not scientific. Shrugging, Mr. Bellanca engaged Pilots Clarence D. Chamberlain and burly Bert Acosta, onetime auto speedster, to test his ship's endurance. Up they put from Mitchell Field, Long Island, with 385 gallons of ethylated (high power) gasoline. All day they droned back and forth over suburbia, circled the Woolworth Building, hovered over Hadley Field, New Jersey, swung back to drop notes on Mitchell Field. All that starry night they wandered slowly around the sky, and all the next day, and through the next night, a muggy, cloudy one. Newsgatherers flew up alongside to shout unintelligible things through megaphones. Messrs. Acosta and Chamberlain were looking tired and oil-blobbed. They swallowed soup and sandwiches, caught cat naps on the mattressed fuel tank, while on and on they droned, almost lazily (about 80 m.p.h.) for they were cruising against time. Not for 51 hours, 11 minutes, 25 seconds, did they coast to earth, having broken the U.S. and world's records for pro-traded flight. In the same time, conditions favoring, they could have flown from Manhattan to Vienna. They had covered 4,100 miles. To Paris it is 3,600 miles from Manhattan. Jubilant, Engineer Bellanca's employers offered competitors a three-hour headstart in the race to Paris. The Bellanca Monoplane's normal cruising speed is 110 m.p.h. She would require only some 35 hours to reach Paris—if she could stay up that long again." New York Times; New York City, New York; January 25, 1928; "Jersey Sheriff Wants Bert Acosta's Plane, Which Flew Away After His Attachment. Bert Acosta's Fokker monoplane The Splitdorf is wanted in Bergen County, New Jersey. Under Sheriff Jack Donaldson wants it. For a little while on Monday afternoon through his deputy, Louis Turro, the ..."
New York Times; New York City, New York; September 19, 1930; "Bert Acosta Freed In Connecticut Case; Two-Year-Old Charge For Stunt Flying At Naugatuck Dropped By Waterbury Prosecutor. Pilot Promises To Behave His Air Record Wins Leniency, But He Faces Federal Inquiry On Flight Without License. Waterbury, Connecticut, September 18, 1930 (Associated Press) Bert Acosta, transatlantic flier, who was arrested in Wilton last night after he had landed his plane in a meadow, received a nolle today in ..."
Time magazine; August 17, 1931; "Captain Lisandro Garay of the Honduran Air Force last week at Floyd Bennett Field loaded a Bellanca monoplane with 360 gallons [of] gasoline and Bert Acosta 'to make a test flight' from New York to Honduras. Unseen Supercargo Acosta sneaked away; Captain Garay took off, headed for Tegucigalpa, reprimand, glory, or death." Time; Monday, June 10, 1935; Long before anyone ever heard of Lindbergh, Chamberlin, Post or Earhart, one of aviation's big names was Bert Acosta. Famed as a ''natural" among pilots, he probably had a greater talent for flying than any man before or since. But like many another early barnstormer and stunter, he took to the fleshpots on earth as an offset to his work in the air. His life, consequently, became a rowdy romance in which brawls, jails and domestic entanglements were due to play a large part. 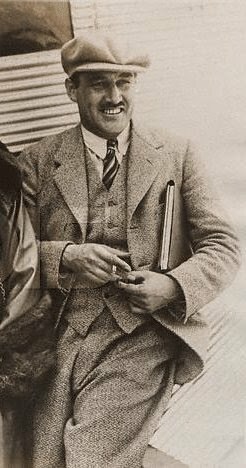 In 1927 Bertrand Blanchard ("Bert") Acosta was chief pilot of Admiral Byrd's transatlantic flight. According to legend, Byrd had to hit him over the head with a fire extinguisher when he got out of hand during the flight. Drink had by that time made him a "physical wreck," according to no less an authority than Anthony H. G. ("Tony") Fokker. Acosta's reply was that "Tony Fokker can go to hell!" Born in San Diego, Calif, of an old Castilian family, Bert Acosta was a professional automobile racer at 13. In 1910, aged 15, he learned to fly in a ship he built himself as a copy of a Curtiss "pusher." Year later he began working for Glenn Curtiss, went to Canada in 1914 to teach Royal Air Force students to fly. Afterward he taught U. S. Army pilots, became a captain in the Wartime Air Service, returned to Curtiss after the Armistice. As chief test pilot there from 1923 to 1925, Acosta had been by all odds No. 1 in his profession. It was his favorite boast that he would fly a barn door if it had wings on it. But as his fame grew, so did his reputation as the "bad boy of aviation." His real troubles began in 1928 when Connecticut suspended his license for trying to fly under a bridge in the centre of his home town of Naugatuck. In 1929 he was fined $500 for low flying and stunting in the same State. When he failed to pay the fine, the Department of Commerce revoked his license. Unchastened, Acosta was arrested by State troopers in 1930 for flying without a license in Connecticut. When medals and decorations which had been showered on him by cities and States began turning up in pawn shops, Acosta explained they had been "stolen." In 1930 his wife had him jailed for nonsupport. When that failed to regenerate him, he was sentenced to six months for abandonment. On his release he was welcomed with open arms by his wife and two sons. Said the warden: ''He was the best man we ever had in jail here." In 1931 Acosta was fined $10 for throwing empty liquor bottles at passersby. Same year, he was arrested for tipsy driving but later exonerated. Backed by ex-Junkman Charles Levine, he started Acosta Aircraft Corp., was charged by New York with selling stock fraudulently. When his wife sued another woman for alienation of affections, and Acosta was named corespondent in a divorce suit, a New York Supreme Court Justice growled: "If it could be arranged to keep this aviator in the air at all times, it would be safer for the homes in this community." Daily News, Frederick, Maryland; December 3, 1936; "Acosta faces rebels"
Time magazine; December 21, 1936; "Hilariously celebrating in the ship's bar of the Normandie with their first advance pay checks from Spain's Radical Government, six able U.S. aviators were en route last week for Madrid to join Bert Acosta, pilot of Admiral Byrd's transatlantic flight, in doing battle against Generalissimo Francisco Franco's White planes. Payment for their services: $1,500 a month plus $1,000 for each White plane brought down." Time magazine; January 4, 1937; "On Christmas Eve the 'Yankee Squadron' of famed U.S. aviators headed by Bert Acosta, pilot of Admiral Byrd's transatlantic flight, at the last minute abandoned plans for a whoopee party with their wives at Biarritz, swank French resort across the Spanish frontier. They decided that they would rather raid Burgos, Generalissimo Franco's headquarters. The hundreds of incendiary bombs that they dropped on White hangars and munition dumps they jokingly described as 'Messages of Christmas Cheer for the boys in Burgos.' "
New York Times; January 16, 1937; page 3; "Flier says lawyer sent him to Spain. Schneider names New Yorker as giving him ticket to join loyalist army. Promised $1,500 a month, but he was never paid, so he quit, witness declares - tells story to U.S. officials. Eddie Schneider, 25-year-old aviator, who recently returned to the United States after serving a month in the so-called Yankee Squadron with the Spanish Loyalists, said yesterday that a New York lawyer had negotiated with him for his services abroad. Schneider, who began his career as a flier in 1928, appeared at the Federal Building, where he was questioned by John F. Dailey Jr., Chief Assistant United States Attorney. Mr. Dailey, who last Thursday questioned Bert Acosta and Gordon K. Berry, both of whom served in the same squadron, is conducting an investigation to determine if the service of the Yankee Squadron in Spain was a violation of a federal statute. That statute provides: 'Whoever, within the territory or jurisdiction of the United States, enlists or enters himself, or hires or retains another person to enlist or enter himself, or to go beyond the limits or jurisdiction of the United States with intent to be enlisted or entered in the service of any foreign prince, state colony, district or people as a soldier or as a marine, or seaman on board of any vessel of war, letter or marquee, or privateer, shall be fined not more than $1,000 and imprisoned not more than 4 years.' According to Schneider, the lawyer told him that he would be paid $1,500 a month for his services in the air force and would receive a bonus of $1,000 for every Rebel plane he shot down. The lawyer, he said, gave him his steamship ticket. Schneider, in an interview with newspapermen, said that he had quit Spain because the Loyalist Government had not carried out its obligations under a contract signed in Valencia. The only money he received, he said, came from the Spanish Embassy in Paris, which paid his fare back to the United States. Colonel Lewis Landes, attorney for Schneider, interrupted to say on behalf of his client that Schneider had really quit Spain because he wished to comply with President Roosevelt's neutrality program. Schneider said that Major Thomas Lamphier was still abroad flying for the Loyalists. He said that he himself had taken part in bombing raids daily for about three weeks. The bombers, he said were remodeled sport planes, and the bombs were dropped through floor openings." New York Times; February 6, 1937; page 4; "Lanphier was not in Spain. Major did not fly for loyalist forces as reported. In the late editions of The New York Times of January 16, 1937, and in the early editions of January 17, 1937 there appeared an item concerning the return of Eddie Schneider, aviator, from serving a month in the so-called Yankee Squadron with the Spanish Loyalists and Schneider's appearance at the Federal Building, where he was questioned by John F. Dailey Jr., Chief Assistant United States ..."
New York Times, New York City, February 20, 1937; "Aviator Held in Nassau in Failure to Post Bail on Wife's Charge. Bert Acosta, who recently faced a Federal inquiry for enlisting in the Spanish Loyalist air force, was rehanded to the Nassau Couny jail here this afternoon pending the posting of a $500 bond to insure his appearance in Children's Court next Friday morning." New York Times; New York City, New York; December 17, 1945; "Bert Acosta in Hospital"
New York Times; New York City, New York; August 12, 1952; "Bert Acosta in Hospital"
Gretchen Hahnen (1902-1986) to Bert Acosta (1895-1954); June 30, 1953; My dear Bert: I was so glad to see this article in the paper, though I knew you were in Denver. A man, whose name I cannot remember, came into the office last spring, he's a flyer, and told me where you were, and that you were getting along fine. I feel terrible not to have written long before this and I am afraid you will think I am not a very good friend, but I have thought of you often and said many prayers for you and now they are being answered. I thought you might like to have this clipping. Do you remember that I had the original picture of you officially receiving the Pulitzer Speed Trophy and wanted it? The reason I didn't give it to you was because I was afraid you would lose it. Several months ago, I sent that picture along with my complete avaiation library of 127 books, to the National Air Museum at the Smithsonian Institution and that is where it is now. They sent me a copy of the picture and I am mailing it to you under seperate cover. The books are catalogues and now known as the "Eddie Schneider Memorial Library" and I am happy about that. When I came back to Forth Worth from New York in 1948, I gave all of Eddie's scrap books, international license signed by Orville Wright and other licenses to the Institute of Aeronautical Sciences in New York. I knew that if anything happened to me, there probably wouldn't be [anyone] who would care about them and that is why I sent all the stuff away. I am delighted to hear that you are going to start writing your memoirs. I have often thought of the opportunity I had when we were living with you and Gloria to have jotted down many of the things you told us to be used for just such a purpose, but now you have lots of time to look over the past and I hope you will. I seldom hear from anyone back East, let alone see them. I hear from Casey Jones once in a while, also Viola Gentry, who is working in New York. Saw Clarence Chamberlin on TV not long ago and he said he was completely out of aviation, though the last time I heard from him, he had been in Bellanca a couple of years ago. After my divorce from Herb Gray, I stopped over in Kansas City on my way to New York, to see Carl Schneider, remember him? His address is P.O Box 23, Muncie, Kansas, in case you ever want to contact him. There was an article in the newspaper last week about Al Baumler, who the last time I saw him he was a Major in the Air Force and is now an Airman 1st Class and is in ... the Americans Millie Lord and I met in France and later in Alicante, and it was through him, that she and I eventually got to Valancia where you and Dingle and Eddie were. Its funny, but I can remember every detail of that trip to Spain. I shall never forget the day you all sailed and when Eddie asked me to have a last drink with him, I started to bawl, you came over, knocked my chin up with your fist, "If your going to drink, smile when you do it." The impact knocked all my tears right and left, and it really helped me to tell him goodbye. I have loads of clippings left, and Eddie's diary on that Spanish deal, so if you need any refreshers, let me know. The enclosed picture is of my mom, who visited us in February for a month and my present husband, and I might add, my last, come what may. She is still full of life and vinegar and can drink me under the table despite the fact I am 20 years younger than she. Three years ago she ran for Republican committeewoman in her district, and won! She was 71 last January. We had a wonderful time when she was here, and she and Grant immediately became buddies. Though I have had two marriages end in tragedy, I am hoping this will last a long time. My husband is a great guy, has over 16 years in the Air Force, over nine of them as a Master Sergeant. He is a Yankee, thank God, no more Texans for me. Gray was a Texan and he told me once, that Texans considered their battle and women in the same category, and that strictly wasn't for me. However, he didn't go haywire mentally, until all of my $10,500 was gone, and now I am as poor as a churchmouse again, but at least I am very happy. ... and electronics specialist. You'd like him, Bert, and vice versa. They are shipping people out of here very fast, but we seem to stay on and watch everyone else leave, however, our turn will come along one of these days. My fervent hope, is that it wouldn't be Limestone, Maine; Rapid City, South Dakota; or Roswell, New Mexico. Of course our preference would be March Field near Los Angeles or that other one near San Francisco, but of course we will have no choice. I wouldn't mind being sent to Europe, France, Germany, Norway, England or even Casablanca, why be in the Air Force and stay in one place? Fort Worth is a nice place, but I've got itchy feet. This is the third summer in a row now that we have suffered with intense heat, up around 104 degress every day, and I don't like it. Both of us would like Denver, it is a really swell place and who knows, you might see us there sometime. Bert, I wont keep on yaking, you must be half dead now after reading all this stuff, but I want you to know I am pulling for you and am so happy you are on the road to recovery. If you are able, I would love to hear from you. Take care of yourself now and with lots of love, I'll close. Mrs. Grant A. Black, (Gretchen Schneider), 6109 Halloway Street, Fort Worth, Texas. New York Times; New York City, New York; September 2, 1954; page 21; "Bert Acosta 59, A Veteran Flier; Piloted Plane With Byrd and Balchen Across Atlantic in 1927, Dead in Denver"
Washington Post; Washington, District of Columbia; September 2, 1954; "Bert Acosta, Atlantic Flier, Dies. Bert B. Acosta, spectacular barnstorming pilot who, with Admiral Richard E. Byrd, made the first trans-Atlantic flight in a multi-engined plane, died yesterday from advanced tuberculosis in a Denver sanatorium, the Associated Press reported." New Bridgeport Telegram; Bridgeport, Connecticut; September 2, 1954; "Denver, Colorado; September 1, 1954 (Associated Press) Bert Acosta, 59, veteran flier and race car driver, died today in the Jewish Consumptives' Relief Society Sanitorium here after a two-year illness. Acosta started flying a self-built plane in 1910 and 11 years later set a new flying speed record of 176.9 miles an hour. He flew with Admiral Richard E. Byrd and Bert Balchen across the Atlantic shortly after Lindbergh's epic 1927 flight. He later became a test pilot and aviation consultant, but collapsed In 1952 on a New York sidewalk with what was diagnosed as an advanced case of tuberculosis. Acosta's ashes will be scattered over the Pacific Ocean near Los Angeles by Commander George Neville. All services, they said, will be private. Acosta was born in San Diego, California, January 1, 1895. His father was a mining engineer, a member of an early-day southern California ..."
Dixon Evening Telegraph; Dixon, Illinois; Thursday, September 2, 1954; "Bert Acosta, Noted Airman, Dies of Cancer. Bert Acosta, whose teenage flights in homemade planes heralded later ventures to aerial fame, died Wednesday, ravaged by cancer and tuberculosis. He was 59. Death came to the sad-eyed birdman at Jewish Consumptives' Relief Society Sanatorium here two years after he collapsed on a New York sidewalk with what was diagnosed as an advanced case of tuberculosis. During his fabulous lifetime, Acosta was in turn a World War I flight instructor, pathfinder for the U.S. air mail service, holder of the 1921 world speed record and coholder of a flight endurance mark. He later became a test pilot and aviation consultant and made his last flight as a pilot in 1946. Relatives said Acosta's body will be cremated and the ashes scattered over the Pacific Ocean near Los Angeles by Commander George Neville. Acosta, a native of San Diego, California, was the son of a southern California mining engineer. He built his first plane in a small barn when only 10, worked for a time with a California aviation firm and in 1914 taught cadets in Canada for the Royal Flying Corps and the Royal Naval Air Service. He was a World War II instructor for the U.S. Army Signal Corps. His world speed record of 171 miles an hour over a closed course was set in 1921 at Omaha, Nebraska, when he won the Pulitzer Speed Trophy. In 1927, he and Clarence Chamberlain. surpassed the existing flight endurance record by staying aloft over Long Island 51 hours, 11 minutes, 20 seconds."